We know you secretly want this. 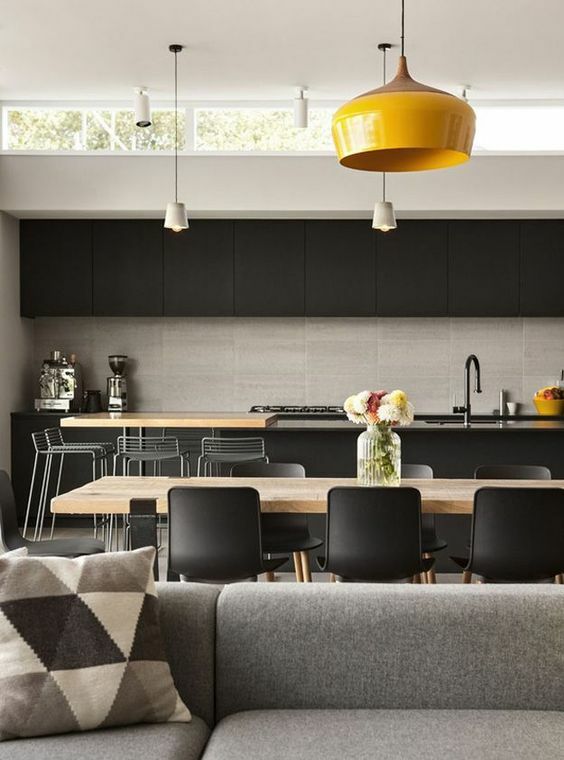 A total matte black kitchen needs a source of natural light. Black absorbs light rather than reflects it. You need to balance the dark features with something light and airy. Paint the ceiling white, install skylights, and have walls of sliding doors. Those are enough to tame the strength of matte black, preventing it from becoming a design disaster. Take the featured kitchen above. The cupboard, rangehood, and island come in matte black. There are huge glass windows that invite a lot of natural light in the space. It also features a metallic faucet and a butcher block which counteract the dark island. Not all houses have window walls or skylights that invite massive amounts of sunlight in the space to make a matte black kitchen work. You need to find ways to balance the colours in your space. Take the kitchen above for example. Only the upper cupboards and half of the splashback is in matte black. The rest come in light neutrals. This combination keeps the kitchen light and airy, despite the use of a strong black colour. Here, the designer painted the lower kitchen drawers in solid matte black. 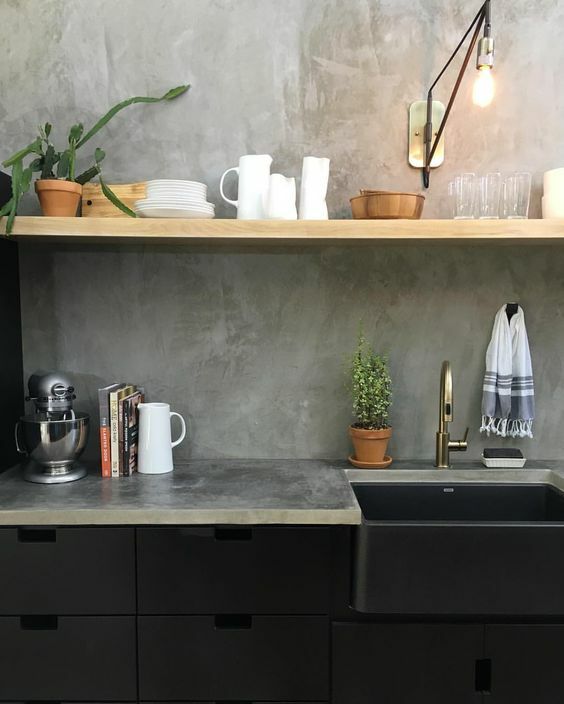 This heavy visual complements the light grey concrete countertops and walls. Eliminating the upper cupboards saves this kitchen from looking crowded. 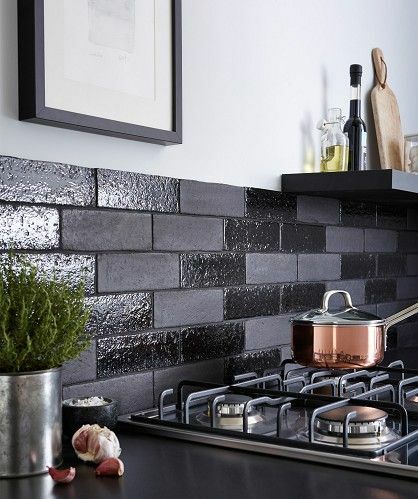 Another trick is to use matte black to enhance vintage or antique features of your kitchen. Take this old brick splashback. The designer painted the bricks with glossy and matte black paints alternately, giving it a new life. If you want, you can still celebrate the original look with a little tweak. 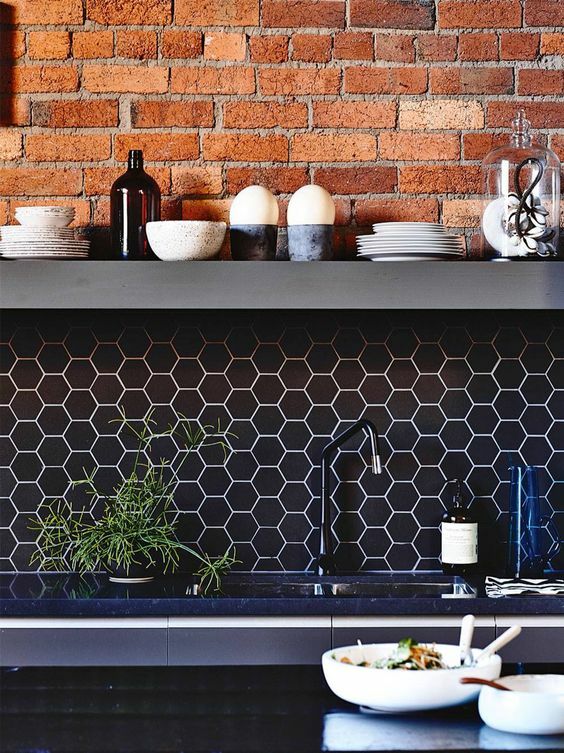 Lay statement tiles such as the hexagon ones on the lower half of the wall. Enjoy the lovely contrast between the modern and vintage elements in the kitchen. We love how the rich red and brown from the bricks contradict the matte black elements under it. That’s elegance and drama in one space. 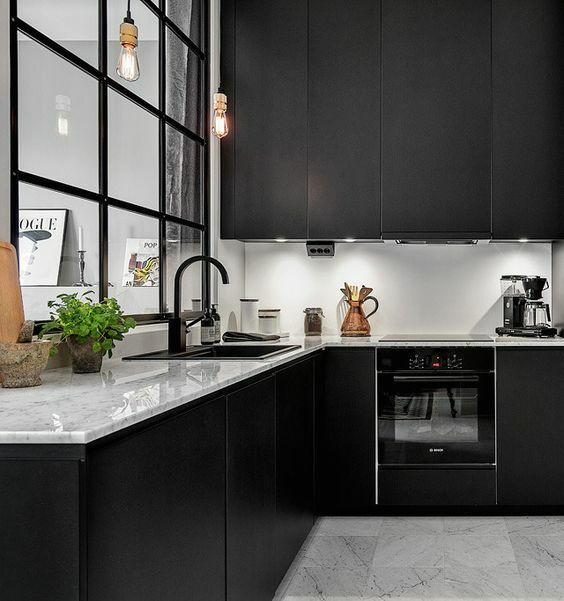 A lot of homeowners still own black and white kitchens. It’s been popular for years! We recommend the use of an accent colour to keep the interiors from appearing cold and boring. Use warm browns, taupes, and beiges. You can also display indoor plants to give your interiors a dose of freshness. It also works well with bright accent colours. Take the lemon yellow light fixture hanging above this open floor plan family room. 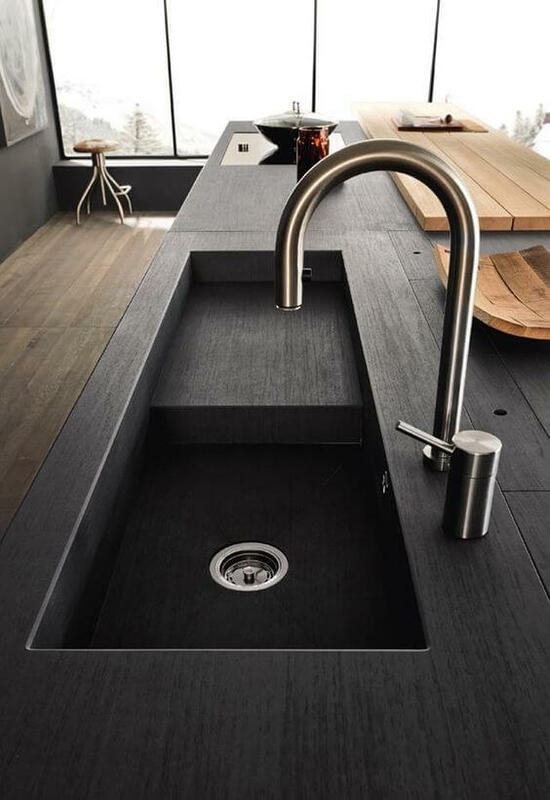 Finally, use matte black to drive people’s eyes to the interesting details, finishes, and fixtures in the kitchen. Take at the splashback made of porcelain tile with marble veins below. 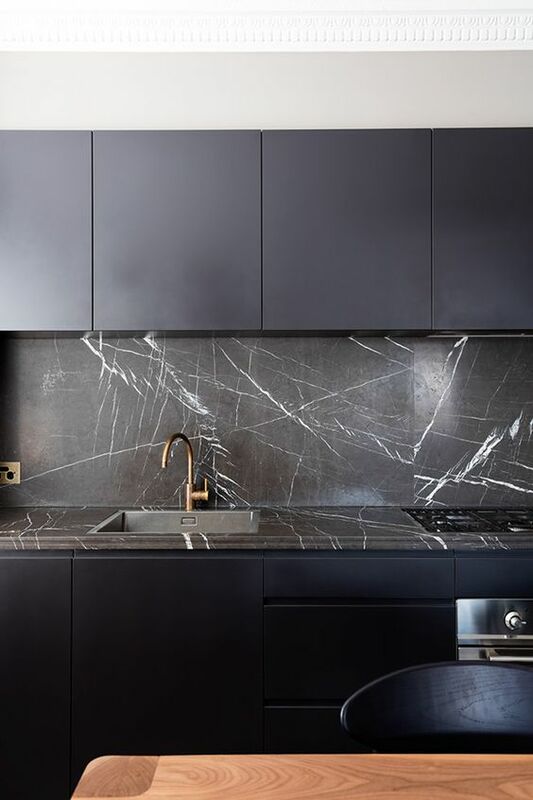 The black tiles will still stand out against white cabinets or a lighter background but the white veins (important) will recede into the background. 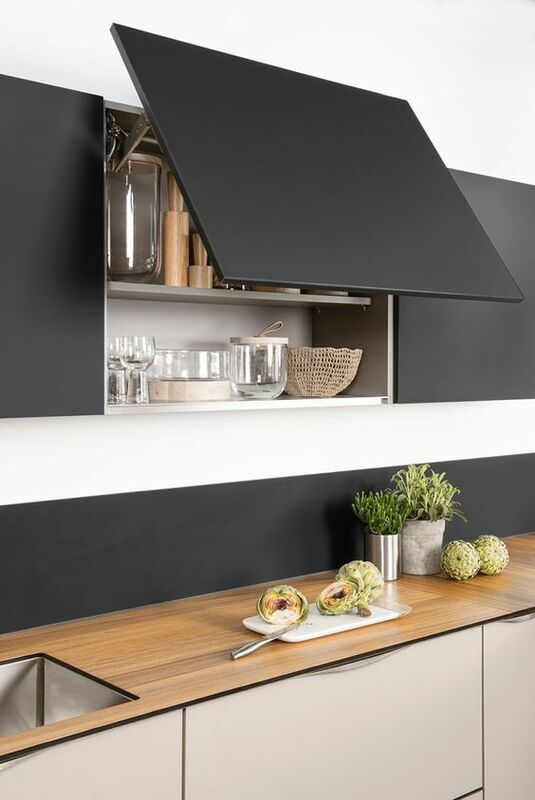 Do you find matte black an interesting addition to your kitchen? 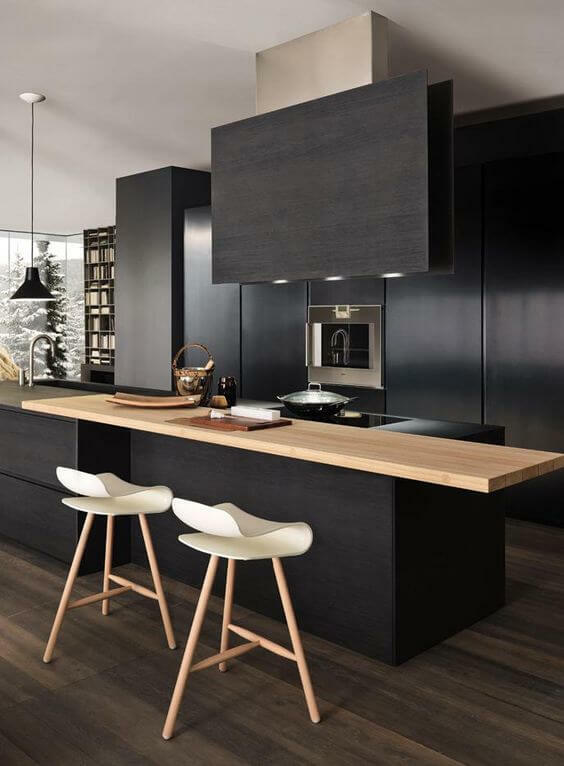 Our kitchen designers are ready to help you design a matte black kitchen. Let’s put this stunning trend in your home this year! Find an awesome architect and kitchen designer in Gold Coast.